The skyTran network will consist of two-person, “jet-like” sky cars which will be suspended from elevated magnetic tracks and will be trialled in Tel Aviv. An artist's impression of how skyTran will look. THE FIRST ELEVATED network of sky cars is expected to be built in Tel Aviv with plans to bring the service to other cities. 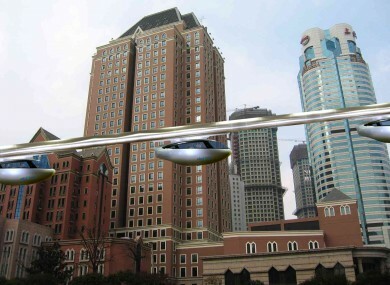 The skyTran transport network, which will work similar to a monorail service, will consist of two-person, “jet-like” vehicles, which will be suspended from elevated magnetic tracks. The project aims to help ease traffic congestion in Tel Aviv and other cities and provide an alternative to commuters. The first version will start out as a 500m loop built around the Israel Aerospace Industries (IAI) campus. The company aims to have the first commercial network, which will cost €58 million to build, up and running by the end of 2016. According to the BBC, the vehicles will be able to reach speeds of 70km/h, although faster vehicles are expected to arrive when the service is rolled out commercially. The CEO of skyTran, Jerry Sanders said that the agreement with IAI was a “breakthrough” for the project. Other areas which are considering building skyTran routes are Toulouse in France, Kerala in India and the San Francisco Bay Area in California. Email “Futuristic: this city is getting its own network of sky cars”. Feedback on “Futuristic: this city is getting its own network of sky cars”.